We’re all cut from the same cloth, or in other words, fabric. It only makes sense that we connect with each other in the most immediate way, with all lines of communication open and inviting. In this blog post I’ll be looking at FabricPath, it’s purpose and how it pertains to the CCIE Data Center lab exam. I’ll also run through a configuration, observing behaviors along the way. For those just looking for a sample config, a full config is provided at the bottom of this post. This post assumes you already have a basic understanding of FabricPath. For those looking for details on FabricPath, here are some great resources that helped me along the way. What is FabricPath and why use it? FabricPath is Layer 2 routing, also known as MAC-in-MAC routing. This is achieved by running IS-IS protocol in the L2 control plane, where it is responsible for building the topology and Shortest Path Tree (SPT). Routing protocols for the win! 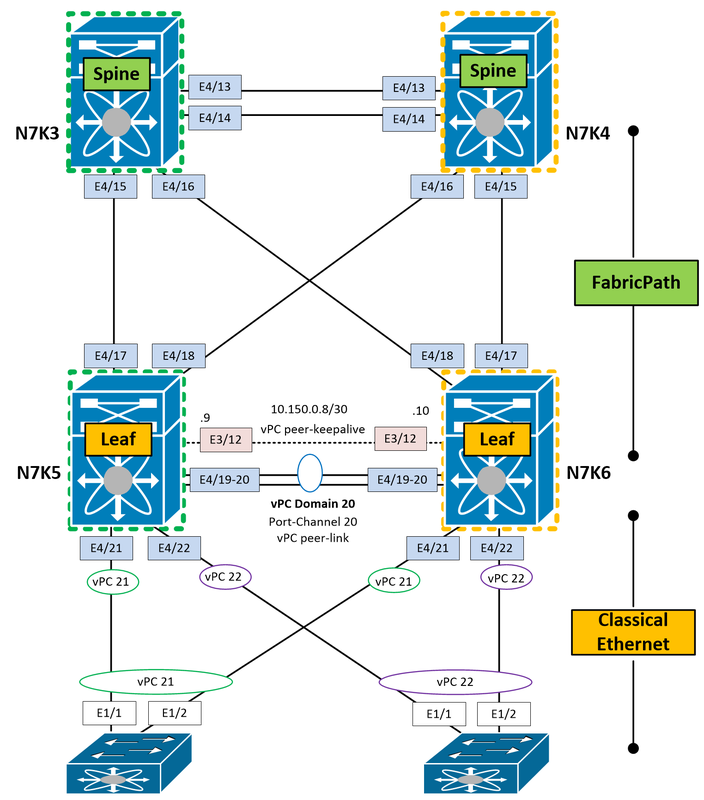 FabricPath was designed to overcome the limitation of Spanning-Tree Protocol (STP). What limitations? Some that come to mind are poor convergence, unnecessary flooding and maintenance of full CAM tables. Oh, and did I mention no ability for equal-cost multipathing (ECMP)?! With FabricPath, we have the capability to actively forward on all links. If there is a failure on one of the links, traffic will be redistributed across all the others. When traffic comes into the FabricPath domain, a single lookup is performed to identify the switch closest to the destination, providing optimal flows. We will be using this topology for this walkthrough. The above topology is STP-only. Before we dive into the configuration, let’s check out the current VLAN database and Spanning-Tree on N7K3. We’ll take a look at this again in a few minutes. Our end-goal will look like this, with FabricPath running between the N7Ks, and Classical Ethernet running to the bottom two switches. All we’ve done so far is enable the FabricPath feature-set. Notice below that we are already assigned a SID (switch-ID). This is a 12-bit address dynamically assigned via DRAP (Dynamic Resource Allocation Protocol), which is used for identifying the switch in the FabricPath domain. As you can see, these SIDs are a little all over the place. We can statically configure these so they’re easier to recognize in the FabricPath domain. Notice we can already run this command to look at the IS-IS adjacencies, which will be used to build our MAC-in-MAC routing topology and shortest path tree. Nothing yet, so let’s bring up some interfaces and look again. First we’ll configure FabricPath on all the layer-2 interfaces on N7K3 and N7K4. Great, we see eachothers SIDs and System-IDs. Notice the “*” indicates the local switch. 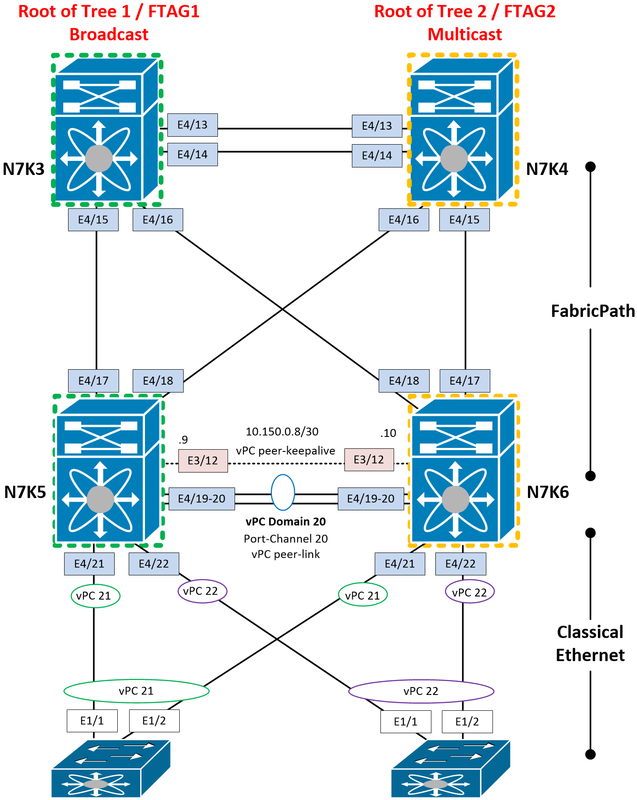 Since all of our layer 2 interfaces are now running FabricPath, is there a need for Spanning-Tree? No spanning tree instance exists. We now see that traffic to 0000.0c07.ac28 will be FabricPath encapsulated with the frame directed towards Switch-ID 73, sub-Switch-ID 0 (used in vPC), and Local ID 4325 (FabricPath edge port the frame will be forwarded on). Note: SID and SWID are used interchangeably to represent Switch-ID. We have adjacencies! Next step is to actually configure VLANs to run in FabricPath mode. Notice that VLANs 40 and 50 now show FABRICPATH as the mode. The VLANs will now participate in the FabricPath domain and will run conversational MAC learning. This topic is covered well in the articles posted at the top of this blog. In short, with conversational MAC learning, the switch will only learn a MAC address if it already knows the destination MAC address, and only if it is a unicast packet. This saves on CAM resources and optimizes the control plane. First, I want to show you what happens when we configure fabricpath VLANs in a vPC environment. 1. We now have a Port Channel Limit of 244. This new limit is imposed due to the new sub-switch (sSID) ID used when running vPC+. This feid identifies the actual port-channel interfaces associated with a a particular vPC+ switch pair. 2. We now have vPC+ Attributes. 20.11.65535 is the SID.sSID.LID we talked about early. Notice we now have sSIDs. Let’s take a look at the FabricPath Switch-ID Table. We have Emulated Switch-IDs that identify the vPC+ switches. You’ll see a single emulated switch-id with two system-IDs that match the actual vPC peers. Since we did not configure all interfaces on N7K5 and N7K6 as mode fabricpath, we must still run spanning-tree for the classical ethernet ports. We can quickly see the ftag/switch-id/subswitch-id routes, and the paths based on the admin distance/metric. Notice on N7K3 that we have two equal-cost paths to N7K4 – 1/74/0 (FTAG 1 / SID 74 / sSID 0 because no vPC involved). FTAGs are used for multidestination traffic, which we will get to very soon. Remember, FabricPath is Layer-2 routing, and we can use our routing protocol IS-IS to engineer traffic. Let’s say we wanted N7K3 to prefer the path over Eth4/14 to get to N7K4. We could increase the metric on Eth4/13 to something higher than 40. We now only have 1 link listed in the route table to SID 74. We know that unicast traffic is L2 routed based on the SID and uses the IS-IS SPT to get to the destination SID. But what about multidestination traffic, such as multicast, broadcast and unknown unicasts? Well, that’s handled a little differently. FabricPath automatically builds two separate logical trees for handling multidestination traffic. The first tree is used to handle broadcast and unknown unicasts, the second tree is used to handle multicast traffic. Each tree is assigned a network-wide identity, known as an FTAG. Let’s take a look at the current multidestination topology. To do so, we can change the root priority. First learning FabricPath, I thought this was an unusual place to configure root-priorty. To easily remember (in case you forget), just do a “show run fabricpath” and you will see the “fabricpath domain default” in the configuration at all times. This is a kindly reminder where you need to configure this parameter. Another fun command is verifying ECMP load-balancing. The default (configurable) load-balancing is shown below. Notice if we change just a single parameter in our flow selector that a different interface is chosen for the ECMP. Notice our adjacencies are lost. Let’s configure the other side. The next form of authentication we have is FabricPath domain authentication which enforces authentication of the actual IS-IS LSPs. Authentication here will prevent routes from being learned, however, we can still form adjacencies even when the domain authentication is mismatched. Once we configure the other switches with domain authentication, our adjacency tables will populate the SIDs, and our route tables will build. As promised, here is a full sample config, N7K3 and N7K4 are configured for authentication. 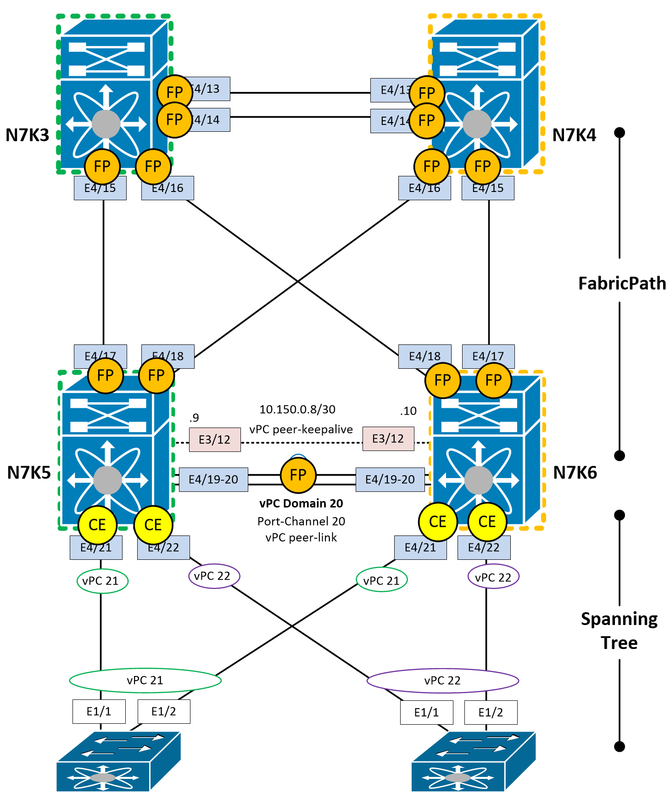 N7K5 and N7K6 are running vPC+ FabricPath. Thank you. Can we also do a dual sided vPC+? You absolutely can, and I have done this during my studies. After doing so, I realized there was no point in it. What you gain in vPC, you lose in FabricPath. At the end, you’ll just have two emulated switches in the FabricPath domain, relying on vPC/LACP for your link hashing rather than FabricPath. Not ideal. Thanks. Say my current setup is a dual sided vpc. on N7Ks where all the default gateway (HSRP) of my downstream devices are all pointing to it. 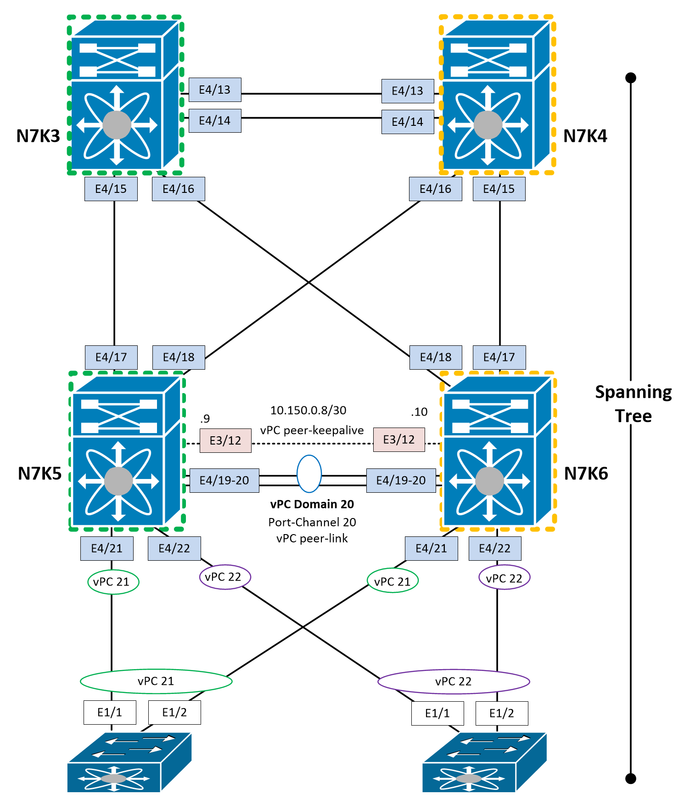 If I will only migrate the LEAF 2xN5K to be a vPC+ then upstream N7K is just totally fabricpath, no vpc just pure fb core ports, then those N7K will have a separate control plain and will probably have duplicates? Or I will migrate the N7Ks to vPC+ but the connection from SPINE to LEAF are FB core ports, will that be an ideal migration plan? Excellent aricle, Thanks for posting. Do we need to allow trunking on the vpc-peer link which is configured in fabricpath mode ? No, this isn’t needed. The actual mode of the port is “fabricpath”. Fantastic Article! Congratulations for your great work; and Thank you for sharing! Awesome! Fantastic article. Much Appreciated. Excellent article,can you share other stuff related to DC. Could you please send me the Nexus 7000 FabricPath pdf document you are linking on your site? Cisco has removed it from their site and I cannot find a copy on the internet. I’m sorry, which document? I wasn’t able to find the broken link.